Python is an all-purpose programming language that can be used to create desktop applications, 3D graphics, video games, and even websites. It's a great first programming language because it can be easy to learn and it's simpler than complex languages like C, C++, or Java. Even so, Python is powerful and robust enough to create advanced applications, and it's used in just about every industry that uses computers. This makes Python a good language for young and old, with or without any programming experience. Before learning Python, you may need to install it. If that command is not found, you'll need to install Python 3 from your package manager. MacOS: If you're on a Mac, follow the instructions for Linux above to see if you have Python 3 installed. MacOS does not have a built-in package manager, so if Python 3 is not found, install it from python.org/downloads/mac-osx. Although macOS does have Python 2 installed, you should learn Python 3. Windows: Microsoft Windows doesn't currently ship with Python. Install it from python.org/downloads/windows. Be sure to select Add Python to PATH in the install wizard. To write programs in Python, all you really need is a text editor, but it's convenient to have an integrated development environment (IDE). 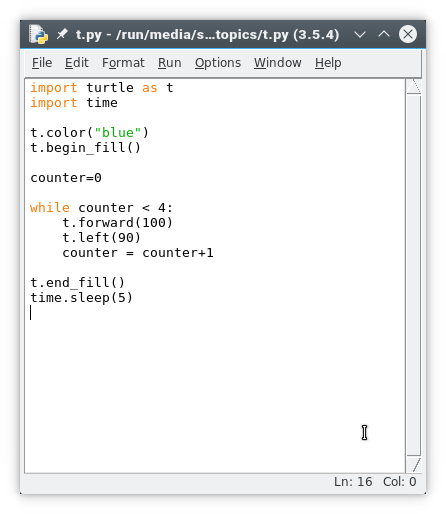 An IDE integrates a text editor with some friendly and helpful Python features. IDLE 3 and NINJA-IDE are two options to consider. Python comes with a basic IDE called IDLE. On Linux or macOS, launch a terminal window and type idle3. On Windows, launch Python 3 from the Start menu. If you don't see Python in the Start menu, launch the Windows command prompt by typing cmd in the Start menu, and type C:\Windows\py.exe. If that doesn't work, try reinstalling Python. Be sure to select Add Python to PATH in the install wizard. Refer to docs.python.org/3/using/windows.html for detailed instructions. If that still doesn't work, just use Linux. It's free and, as long as you save your Python files to a USB thumb drive, you don't even have to install it to use it. 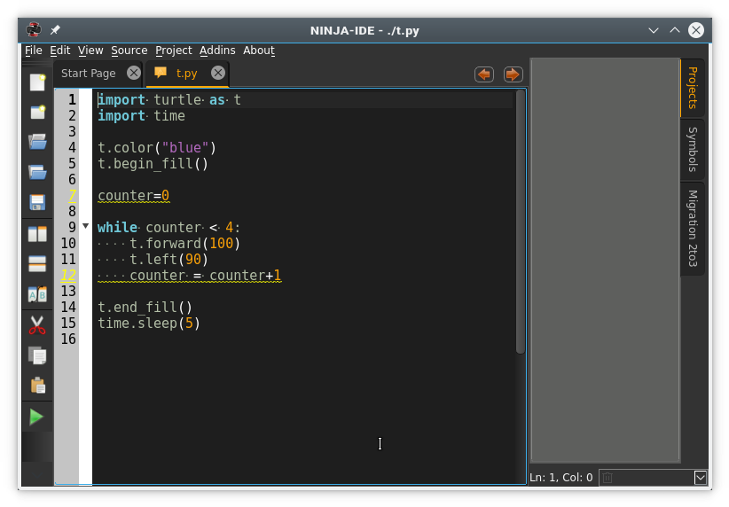 Ninja-IDE is an excellent Python IDE. It has keyword highlighting to help detect typos, quotation and parenthesis completion to avoid syntax errors, line numbers (helpful when debugging), indentation markers, and a Run button to test code quickly and easily. Install Ninja-IDE. if you're using Linux, it's easiest to use your package manager; otherwise download the correct installer version from NINJA-IDE's website. In the Preferences window, click the Execution tab. In the Execution tab, change python to python3. Keywords tell Python what you want it to do. In either IDLE or Ninja, go to the File menu and create a new file. Ninja users: Do not create a new project, just a new file. 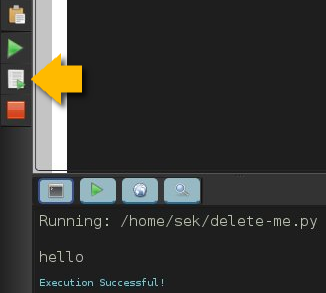 If you are using IDLE, go to the Run menu and select Run module option. The keyword print tells Python to print out whatever text you give it in parentheses and quotes. That's not very exciting, though. At its core, Python has access to only basic keywords, like print, help, basic math functions, and so on. Use the import keyword to load more keywords. Start a new file in IDLE or Ninja and name it pen.py. Warning: Do not call your file turtle.py, because turtle.py is the name of the file that contains the turtle program you are controlling. Naming your file turtle.py will confuse Python, because it will think you want to import your own file. See what shapes you can draw with the turtle module. To clear your turtle drawing area, use the turtle.clear() keyword. What do you think the keyword turtle.color("blue") does? Once you have run your script, it's time to explore an even better module. To learn more about how Python works and prepare for more advanced programming with graphics, let's focus on game logic. In this tutorial, we'll also learn a bit about how computer programs are structured by making a text-based game in which the computer and the player roll a virtual die, and the one with the highest roll wins. Start the dice game and press Return or Enter to roll. The results are printed out to your screen. You are prompted to roll again or to quit. Player: You need a human to play the game. AI: The computer must roll a die, too, or else the player has no one to win or lose to. Random number: A common six-sided die renders a random number between 1 and 6. Operator: Simple math can compare one number to another to see which is higher. A win or lose message. A prompt to play again or quit. A variable is a value that is subject to change, and they are used a lot in Python. Whenever you need your program to "remember" something, you use a variable. In fact, almost all the information that code works with is stored in variables. For example, in the math equation x + 5 = 20, the variable is x, because the letter x is a placeholder for a value. An integer is a number; it can be positive or negative. For example, 1 and -1 are both integers. So are 14, 21, and even 10,947. Variables in Python are easy to create and easy to work with. This initial version of the dice game uses two variables: player and ai. Launch your game to make sure it works. This basic version of your dice game works pretty well. It accomplishes the basic goals of the game, but it doesn't feel much like a game. The player never knows what they rolled or what the computer rolled, and the game ends even if the player would like to play again. This is common in the first version of software (called an alpha version). Now that you are confident that you can accomplish the main part (rolling a die), it's time to add to the program. In this second version (called a beta) of your game, a few improvements will make it feel more like a game. If you run the game now, it will crash because Python thinks you're trying to do math. It thinks you're trying to add the letters "You rolled" and whatever number is currently stored in the player variable. You must tell Python to treat the numbers in the player and ai variables as if they were a word in a sentence (a string) rather than a number in a math equation (an integer). Run your game now to see the result. Computers are fast. Humans sometimes can be fast, but in games, it's often better to build suspense. You can use Python's time function to slow your game down during the suspenseful parts. Launch your game to test your changes. If you play your game enough, you'll discover that even though your game appears to be working correctly, it actually has a bug in it: It doesn't know what to do when the player and the computer roll the same number. To check whether a value is equal to another value, Python uses ==. That's two equal signs, not just one. If you use only one, Python thinks you're trying to create a new variable, but you're actually trying to do math. When you want to have more than just two options (i.e., win or lose), you can using Python's keyword elif, which means else if. This allows your code to check to see whether any one of some results are true, rather than just checking whether one thing is true. Launch your game a few times to see if you can tie the computer's roll. The beta release of your dice game is functional and feels more like a game than the alpha. For the final release, create your first Python function. A function is a collection of code that you can call upon as a distinct unit. Functions are important because most applications have a lot of code in them, but not all of that code has to run at once. Functions make it possible to start an application and control what happens and when. This version of the game asks the player whether they want to quit the game after they play. If they respond with a Y or y, Python's exit function is called and the game quits. More importantly, you've created your own function called dice. The dice function doesn't run right away. In fact, if you try your game at this stage, it won't crash, but it doesn't exactly run, either. To make the dice function actually do something, you have to call it in your code. Add this loop to the bottom of your existing code. The first two lines are only for context and to emphasize what gets indented and what does not. Pay close attention to indentation. The while True code block runs first. Because True is always true by definition, this code block always runs until Python tells it to quit. The while True code block is a loop. It first prompts the user to start the game, then it calls your dice function. That's how the game starts. When the dice function is over, your loop either runs again or it exits, depending on how the player answered the prompt. Using a loop to run a program is the most common way to code an application. The loop ensures that the application stays open long enough for the computer user to use functions within the application. Now you know the basics of Python programming. The next article in this series will describe how to write a video game with PyGame, a module that has more features than turtle, but is also a lot more complex. Looking forward to read whole series. Thanks for reading! Python's a really neat language, and I enjoy teaching it (enforced whitespace notwithstanding). Am reading the “Think Python” book and it all starts making since now. Immersion helps a lot. The other thing that helps is having a project. Even if it's something simple, or silly like a game, you really get to know a language by trying to make it do something specific. Thanks for reading my article! That is such an important point Seth, One does learn faster if one has a project they want to do. I learned Java trying to make a screen sharer, desktop environment, and password manager. I am not great at programming per say, yet, but I have learned advanced concepts such as inheritance, threading, and server/client socketing because of specific projects I wanted to do and the usefulness of such concepts. This is such a great article Seth! I'm sharing it with my Python coding class today. Thanks for sharing your expertise. Great! There's more to come! For me, I find a very efficient way to work on syntax is python on the command line. Just type 'python', and you're in a running python console, which saves values so that you can enter sequential commands. Type 'Ctrl-D' to exit. This is good for testing code, but for iteration I find it less helpful. Students usually need to revise and build upon their code, and that's a bit difficult to do when you're working in the terminal version of IDLE. I'm looking forward to PyGame! I've played around with it and found its many features a little bewildering. I plan on covering it over the course of about 10 more articles, so it'll be a journey - but it'll be worth it, I promise! Something else I was thinking of is that it's never too early to think about documentation, in this case comments in the code, which are mostly needed by yourself when you haven't looked at the program for 6 months to a year. So true. Someone said to me recently "code is read more often than it is written". So the readability of code, comments being the prose side of that, is really really important! Great article. Dice are actually a great starting point to get familiar with something simple in python. My first personal project in python was a dicewarebot for mastodon (https://botsin.space/@dicewarebot). Same idea with a little more complexity, but it's basically just rolling dice. That sounds great! I'm on mastodon, so I'll check it out! I think there's a lot to be said for challenging new programmers (or ourselves) with randomness challenges. It's one thing to fall back on /dev/random or rand.range() but it's quite another to try to invent other sources of random data from which we can generate our dice roll results. When I teach a dice app to people, I sometimes don't tell them about /dev/random. I give them other tools, like the math operators, time stamps, and other things like that, so they can try to invent randomness. It's a great mental and programming exercise.
" " print("The computer has rolled a " + str(player) ) " "